SMECO’s Outstanding Teachers from St. Mary’s County are, seated from left: Alesha Boyd, Dynard Elementary School; Tabitha Ringer, Margaret Brent Middle School; and Taren Long, Chesapeake Public Charter School. Standing, from left: Tara Everly, St. Mary’s Ryken High School; Stephanie Stone, Chopticon High School; and Kara Sostre, Evergreen Elementary School. Not pictured, Amanda Kellam, Greenview Knolls Elementary School. 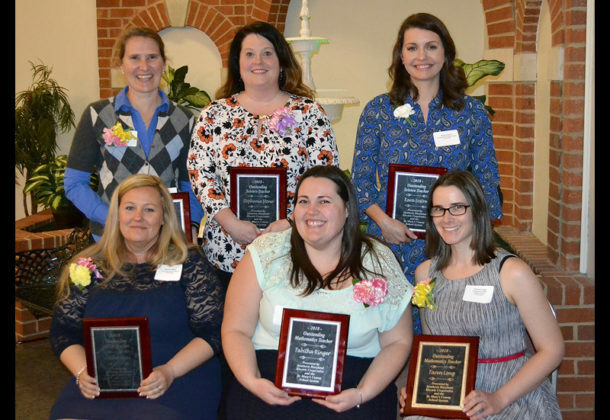 Southern Maryland Electric Cooperative has chosen 20 educators from the school systems of Calvert, Charles, and St. Mary’s counties as Outstanding Teachers because of their leadership in the fields of mathematics, science, technology, and engineering. 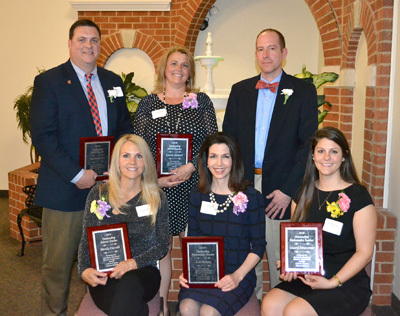 Nine math teachers, six science teachers, and five STEM (science, math, engineering, and technology) teachers from schools in the three counties were awarded. Each was chosen for his or her outstanding performance in the areas of creativity, enthusiasm for teaching, rapport with students, professionalism, and innovative teaching methods. The teachers received plaque and cash awards during a dinner held in their honor. During the past 27 years, SMECO has recognized more than 370 of the region’s math and science teachers. The keynote speaker for the event was Lawrence M. Clark, an associate professor at the University of Maryland Center for Mathematics Education. Mr. Clark said good teachers in the STEM disciplines have three qualities: a commitment to sustaining and nurturing their fascination with the world, viewing the world through a STEM lens; a commitment to collaborating with colleagues in and out of their schools; and the ability to see a scientist or mathematician in every child they teach. As a former middle-school math teacher, Mr. Clark noted how demands and expectations have changed for teachers in STEM. He encouraged them to try to understand their communities and environments outside their schools and to search for ways to incorporate the realities of students’ worlds into each of their classrooms. 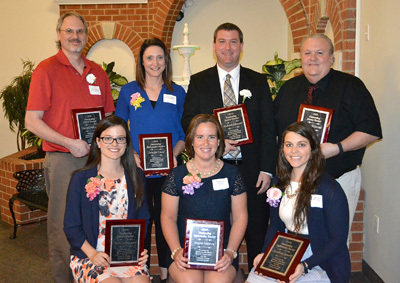 SMECO’s Outstanding Mathematics, Science, and STEM Teachers of the Year are listed below. Seated, from left: Wendy Farrell, Huntingtown High School; Kim Bracey, Mount Harmony Elementary School; and Laurel Newcomer, Plum Point Middle School. Standing, from left: Marshall Pike, Calvert Career and Technology Academy; Karin Stewart, Calvert Middle School; and Rolf Arnesen, Huntingtown High School. Seated, from left: Monica Morgan, Benjamin Stoddert Middle School; Megan Parsons, Theodore G. Davis Middle School; and Christina Laverty, Henry E. Lackey High School. Standing, from left: Daniel Meltsner, John Hanson Middle School; Jennifer Davis, Malcolm Elementary School; Michael Johnson, William A. Diggs Elementary School; and Michael Forrest, Matthew Henson Middle School. Enhancing the quality of life in Southern Maryland is part of SMECO’s core mission. The cooperative sponsors events for students in hopes of encouraging them to excel in math, science, and technology. These events include the local MATHCOUNTS competition, the annual Southern Maryland Regional Computer Bowl, and the Elementary Math Challenge. So far this year, nearly 1,200 students in SMECO’s service area have participated in these events. To learn more about SMECO, visit its Leader Member Page.